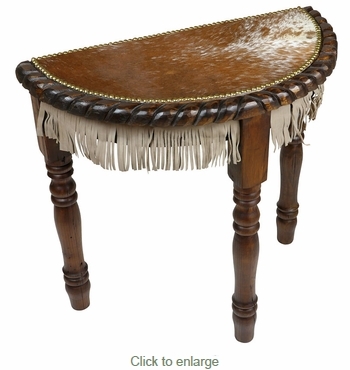 This western half-moon accent table with cowhide top and leather fringe exemplifies the spirit of the West. The turned legs are accented by a carved braided rope design edge and rimmed with brass clavos. The one-of-a-kind character of this western half-circle table is enhanced by the patina stains and premium selected cowhide. Handcrafted by artisans in Mexico, our western cowhide furniture is perfect for your southwest ranch or cabin decor.